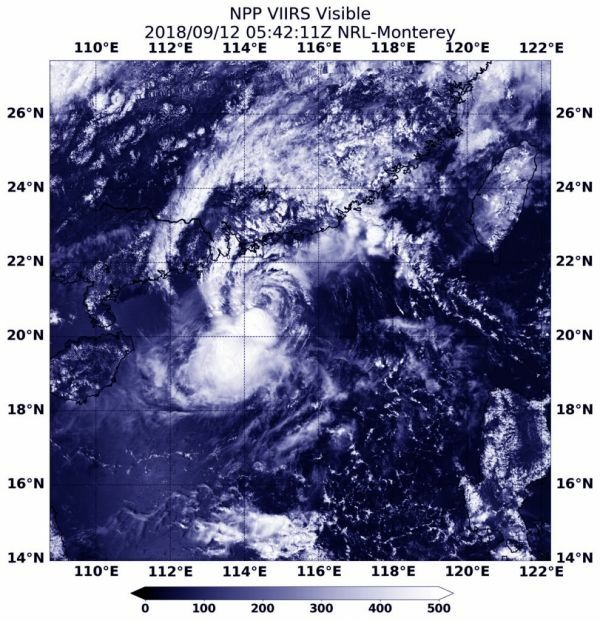 NASA-NOAA’s Suomi NPP satellite found that as Tropical Storm Barijat was affecting Southern China, wind shear was affecting the storm. Visible imagery on Sept. 12 at 1:42 a.m. EDT (0542 UTC) from the Visible Infrared Imaging Radiometer Suite (VIIRS) instrument aboard NASA-NOAA’s Suomi NPP satellite showed that Barijat was being affected by northerly vertical wind shear that was pushing the bulk of its clouds southwest of center. In general, wind shear is a measure of how the speed and direction of winds change with altitude. Wind shear can tear a tropical cyclone apart or weaken it. The latest Tropical Cyclone Warning Bulletin issued by the Hong Kong Observatory (HKO).at 1:45 p.m. EDT (01:45 a.m. HKT on Sept. 13) reported that the Strong Wind Signal, No. 3 is in force. That means that winds with mean speeds of 25 to 38 mph (41 to 62 kilometers) per hour are expected. Image: Visible imagery on Sept. 12 at 1:42 a.m. EDT (0542 UTC) from the Visible Infrared Imaging Radiometer Suite (VIIRS) instrument aboard NASA-NOAA’s Suomi NPP satellite showed that Barijat was being affected by wind shear that was pushing the bulk of its clouds southwest of center.